Happy New Year To All! --- and Happy Valentine's Day too!!! May 2004 bring you good health, good fortune, good friends, and great times shared with your English Springer Spaniel(s). Here it is the third day of February, 2004, and I am finally sitting down to type up an update of what's been happening here at Nanjay. Snow, snow, snow, ---- winter is certainly making it's presence here in Caledon East, Ontario. Cold weather alerts, closed roads, 'snow days' (which means the schools are closed), minus 40 degree temperatures -- I am hating it -- and the Springers are loving it! Anyone who has ever had the fortune to watch a couple of Springers romp and play in the snow knows what I mean. I wanted to start this update by offering my congratulations to the Ingram family on the accomplishments of their young black and white boy, 'Gilmore' (a.k.a. 'Delmar') 'Ch. Nanjay's No Doubts'. Delmar competed in his first dog show on December at the renown Credit Valley Kennel Club conformation dog show. The Ingrams were concerned about Delmar making his 'debut' at this show, as I hadn't taken him to any show training classes or sanction matches; he hadn't been in a ring, or even seen a mat before the day of the show! I told the Ingrams not to worry as all of the Nanjay Springers are natural hams, (er I mean showmen) and he would be fine. So fine, in fact, that all three days at the show Delmar won Best of Breed (from the senior puppy class), made two cuts in the group, won two Best Puppy In Groups and Two Best Puppy In Shows!! He also competed in the annual Puppy Of The Year competition (which happens to be held at the Credit Valley Show) and proudly walked out with a group fourth. Some first day in the ring, n'est pa? We are all so proud! Delmar then traveled to London, Ontario, in January, for the Elgin County Kennel Club dog show where he finished his championship (undefeated)! Things would be amiss with my son if I did not offer an update on his liver and white puppy, 'Everett', 'Ch. Nanjay's No Regrets.' Everett finished VERY quickly as a puppy, with several Best of Breeds to his credit. He also earned six Best Puppy In Groups and one Best Puppy In Show -- quite a triumph for such a young boy! Everett qualified to enter the Puppy Of The Year event at the Credit Valley Dog Show, where he was awarded a group third in the sporting group for his age group (he and his litter brother, Delmar, were the youngest puppies showing!). We are so proud of these two brothers and look forward to their sister, 'Foxy' making her debut in the ring later this year. Oh yes, you can see both of the brothers' photos in the 'Conformation Show Pictures' section of this web-site. Special congratulations to all of the families who have been doing so well at the 'Puppy Kindergarten' and 'Beginners Obedience' classes. Most of the puppies that were welcomed into their new homes this past fall/winter have attended or are attending classes. They are great fun for the entire family and the puppies learn SO much. I have been getting several calls and e-mails telling me how their Nanjay puppy did so well in class and how they were voted 'the best trained' and 'the cutest puppy' (we agree with that)! I applaud all of the work that everyone is doing to assure that their baby is trained properly and will be not only a good family member, but also a good canine citizen. Four paws up to you all! 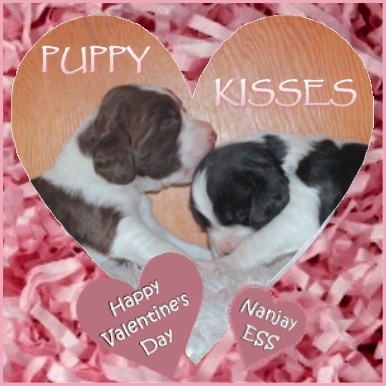 I would also like to take this opportunity to thank all of the terrific families who are sharing their homes with a Nanjay puppy for sending me the wonderful Christmas and New Year photos of their Nanjay Springers -- you all know how I love my photos! I cannot express to you the joy and satisfaction I have when I get these little notes and photos -- treasured additions to the Nanjay Family Photo Album. Many thanks. I would also like to start this year out by giving credit where credit (and thanks) are due. ~ William Alexander has been handling my English Springers at the dog shows for several years now, and I cannot fully express my gratitude and respect enough for the amazing job he and his team have done. William and Monica's professional handling and grooming are second to none. But more importantly, the care and affection that Monica Park, William Alexander and their assistant, Norm Fargo, offer my Springers is first rate. I am very secure in knowing that while my 'babies' are away from home they are with some wonderful people who really enjoy the time they spend with the dogs. I know that they will always keep everything fun for my dogs, as well as represent Nanjay with great professionalism. William, Monica and Norm --- thank you.